Advertising used to be simple. As the number of potential advertisers and publishers grew, however, it was nearly impossible to track down and maintain a handle on all direct media buying processes. That is when ad networks were born – to help marketers scale in a fragmented world. With all this complexity, advertisers just can't keep up. There's a $25 billion -- that's with a B -- mobile advertising gap. So what are you going to do about it? And how do you start pulling in the mad revenue that's waiting to be taken? We'll share the findings of our most recent VB Insight report on mobile advertising, chock full of advice to help you understand the mobile advertising ecosystem. We've got the best practices for mobile advertising and the five biggest mistakes you can make as a marketer in this space. And best of all, we'll walk through the best ad networks for various use cases. 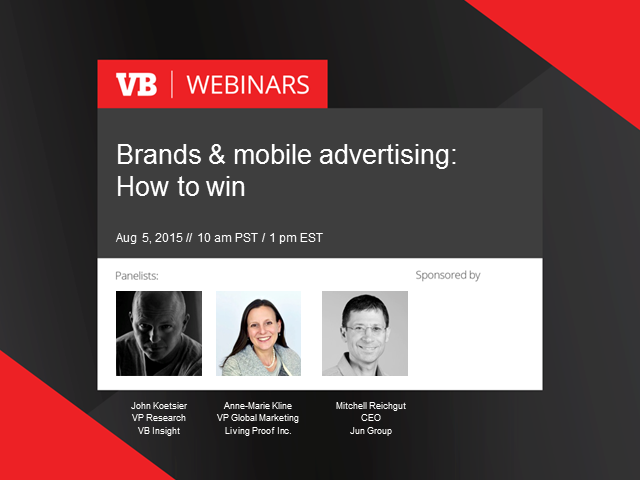 This webinar will be based on John Koetsier’s VB Insight report, which published in June, 2015.